Substance abuse professionals have long incorporated a variety of methods into recovery treatment plans. Much emphasis is placed on evidence-based practices, such as pharmacological treatments and behavioral therapies as primary methods, and for good reason. There is considerable scientific research and testing of these evidence-based practices. However, a patient may not respond to these primary treatments, and other, less traditional tactics may be necessary as an enhancement. Art and music therapies have grown to be less scientific but still accepted practices as expressive therapies or complementary and alternative medical practices. Artistic expression, whether through visual or musical creation or appreciation, touches people in their core. Music affects mood. A visit to the art museum can bring a wide range of feelings. Proponents of expressive therapies argue that having a sense of purpose, achievement, positive relationships, and engagement are all crucial to well-being. For many, artistic expression checks all of those boxes. Treatment centers and practitioners have recognized the power of creativity and appreciation, incorporating both art and music into their programs. A study from 2014 showed that 36 percent of U.S. treatment centers had incorporated art therapy into their programs, while 14 percent offered music therapy. The study noted the increase in popularity in complementary and alternative medical practices, such as art and music therapy, and suggested a relationship between the therapy and recovery success in women and adolescents. Visual arts seem to be particularly effective, possibly because they are so accessible as therapeutic exercises. Most patients can pick up a paintbrush and put something on the canvas; talent is not required to make art. Physically, artistic expression connects us to our emotions. It is a tangible way to reconcile emotional conflicts. This connection can help fill the void that drugs and alcohol leave in a substance abuser. Music can have a similar effect for those suffering with addiction and has been used as a component of physical health since the 1700s. As a therapy, music has moved into the mental health field over the past century. Music has long been a part of the human experience. Every culture has its musical traditions, and every generation can be partially defined by its popular music. What is as emotional as the national anthem, a rousing orchestral maneuver, or a triumphant celebratory pop tune? Music can relax or annoy as well. Its ability to trigger emotions is key to a patient’s ability to access those emotions as part of treatment. And, like painting, creating music can positively affect mood as well. One study of dementia patients brightened moods of the participants by having them create their own orchestra. One of the major benefits of both art and music therapies is that they are generally cheap and noninvasive. As a treatment provider, you risk that some patients will resist the treatment—maybe they have a low level of interest in general or are apprehensive about expressing themselves. But many respond to art and music therapies given the fact that these therapies are refreshingly different than the perceived negatives of traditional treatment. For those patients, viewing art may be their exposure to the therapy, and maybe that will be sufficient to elicit a connection to emotions. Keep in mind, too, that these expressive therapies are meant as enhancements. They help patients open up to other therapies. They might not work for everyone, but for many, expression can open windows into emotions, and tapping into this can be helpful in addressing underlying causes of addiction. I used to think that if I became a better person for someone, I would have a greater chance of being accepted by them. This was great motivation until the inevitable set in: rejection. Then, that part of me was gone, and nothing else mattered. Why improve if no one would appreciate it? As I’m starting to learn, people will come and go in life, but you will always have yourself. Every day, you will look at yourself in the mirror. Do yourself a favour: stop changing for other people, and instead, change for yourself. Commit to becoming a better person than you were yesterday. Commit to routines, healthy lifestyles, and learning for life. Commit to excellence. You have control over your quality of life, your successes, and your reasons for living; don’t let other people choose for you. That being said, it is good to change for friends or in memory of loved ones. But keep in mind that relying on people for motivation leaves room for excuses, and doing things for people can give you false hope. Change must come from the heart. Many times in life, when we are faced with overwhelming feelings, we wonder why our bodies are making us feel this way. In part, this is due to our natural response to external stressors, also known as the fight or flight response. The response uses our emotions to tell us that something isn’t right. Ever since I was young, I’ve always been a very emotional person. Over the years, I’ve learned to hide my emotions. I’ve had feelings for this girl for the last two years. Before her, I had been in a ‘relationship’ that started from an amazing friendship and ended very, very badly: even after six years, I still have nightmares about her. I tried to tell myself that I didn’t like this girl, that I was too busy with school and curling to even consider a relationship, and that I didn’t want a repeat of my previous relationship. It worked for two years. This summer, I worked long hours in the bush. I had a lot of time to read, write, and think. But of all three things, I could not control what I thought. The feelings that I had buried for two years resurfaced, amplified over the years of lying to myself. The once-beautiful emotions overflowed with dread. I could no longer deny it. Not to myself; not to her. Even though I had seen all of the signs that the feelings weren’t mutual. There is a stigma that people should be ‘strong’ and not express their feelings. I used to be part of this stigma. By denying or not expressing your feelings, you can temporarily override this response. However, your body might turn up the volume through amplifying the emotions that are associated with the response. If they are repeatedly suppressed, these emotions can build to become daunting and unbearable, until they break us. This is exactly what happened to me. Not only was I pushed over the edge with intensified feelings, but the aftermath—knowing that I had devoted two years to denial instead of acceptance, increasing the emotional stakes just to find the same answer—left me in a well of heartbreak that could have partially been prevented. Mental health awareness encourages people to talk about how they feel and encourages the idea that it’s okay to not be okay. Telling yourself that life is ‘fine’ is another way to be nondescript about what is really happening. Part of the reason why it took me six years to get over my last relationship was because I pretended that everything was okay, and I remember explicitly telling myself that I didn’t need friends. So this time, when people asked how I was doing, I tried to tell the truth. When I wasn’t okay, I reached out to some of my closest friends. But accepting these emotions—sadness, heartbreak, anguish—doesn’t mean that I am only feeling broken. I started to remember the parts of life that I had always loved: walking down the sheet in solitude during curling practice, the exhilaration of biking, and sharing special moments with friends. She still comes across my mind often and the emotional pain returns frequently, but those feelings don’t stop me from enjoying the other parts of my life. Ultimately, your feelings are a choice—you define what makes you happy. Lastly, all things take time. Like physical injuries, rushing yourself will prevent a full recovery. Even feelings take time to emerge and they can’t be forced. Sadness struck me several hours after she admitted that the feelings weren’t mutual, and heartbreak will stay for longer, but I know that I’ll be okay with time. Listen to your heart. You can choose your emotions. Give it time. One day in grade three, we went to the Disney store. At that time (and even still now), I had an obsession for Stitch from the Disney movie, Lilo & Stitch. In the store, there was a large pile of Disney plushies, but there was only one Stitch plushie that actually looked like Stitch (the other models were simplified towards disfiguration). At once, I picked up that Stitch plushie, the last of his kind, and said that I needed him. But it wasn’t to be. Stitch was too expensive, and he was roughened by life on the pile. There were no more of him in stock, and the other Stitch models were not good enough. No one would buy him. That was why he was the last of his kind. My dad told me it was time to go. My eyes flashed at him, and I hugged Stitch with all of my strength as a little boy. I wasn’t going to leave Stitch. He was mine. I yelled; I screamed; I cried. Nothing was going to faze my dad. You see, we were taught to be disciplined, but I had none at this moment. This was unacceptable behaviour. Towards the hour mark, as I continued with my whining and begging and wailing, my grandmother finally said that she would buy him as a gift. My grandmother passed away a year later. This is a reoccurring theme. I’ve always had the gift and curse of knowing exactly what I wanted. While everyone was worried about what they would do for the rest of their lives, I had known since kindergarten that I wanted to become a mineralogist. In class, I would disregard my teachers’ instructions so that I could use my idea for a project. I always knew who I liked. However, having such strong feelings of desire has a downside. It is hard to differentiate between wants and needs. Needs are essential for your living; wants are things that you desire, but they are not essential for living. Not knowing the difference between wanting and needing is fine when it comes to success, but dangerous when it comes to failing. Everyone fails at some point in life. But when I failed, whether it be in academics, athletics, or relationships, I felt as if my life had ended. Living without something that I thought I needed was impossible. As a perfectionist, I could not handle reality. To keep myself alive, I taught myself not to want, not to care, but in the process, I lost my motivation to live. Desire gives direction and meaning to life. Avoiding problems doesn’t solve them. One theme that is shared between my writing and my life is that everything is interconnected. Lessons in one domain of my life are applicable to another. School, sports, arts and relationships are all learning opportunities. I am starting to learn that these are only a part of my life; they do not define who I am. Failure, or not achieving the desired outcome, is an opportunity to learn, and it is not failure itself that matters, but how you respond to failure that does. Understanding the difference between wanting and needing allows you to dream big, while realizing that your failures will not define your life. Check out this amazing article on High North News! North in Focus Partners with Students on Ice! North in Focus is excited to announce our partnership with Students on Ice! Students on Ice (SOI) is a foundation which strives “to educate the world’s youth about the importance of the Polar Regions, to support their continued learning and growth and inspire initiatives that contribute to global sustainability.” SOI takes youth on extraordinary educational expeditions to the Poles (Arctic and Antarctic regions) to immerse youth in all aspects of these regions. SOI’s partnership with NIF reflects an intimate connection between the two organisations: NIF core team members Eva Wu, Gabrielle Foss, Ashley Cummings and Patrick Hickey, as well as Youth Engagement Advisor Ocean Wyatt, and Ambassadors Abhayjeet Singh Sachal, Didiane Shenge, Malu Ostermann, Cassie Jones, Caitlin Gilchrist and Raphael Dury are SOI alumni. For many of us, our inspiration for putting #northinfocus was nurtured, if not cultivated, by SOI. With the positive impact of SOI on us, as individuals and as an organisation, we hope to impart a positive impact on the youth of Arctic and Subarctic communities in Canada, through week-long mental wellness workshops. “Students On Ice gave me an experience that created more confidence in myself and my endeavours as well as connected me to other youth who are interested in making change. This is where I met Gabi and got introduced to Art with Heart, and a few months later I met Patrick and we connected through SOI and I got introduced to what is now North in Focus. Once I became a part of NIF, it was no surprise to connect so deeply with Eva, another alumna. The Students On Ice Foundation truly is the foundation that I've built my passion for change on. It has provided such a strong connection between so many people. Having this partnership is a dream come true to have a deeper connection with an organization that truly shifted my perspective on the world." So what exactly does the partnership entail? Alumni and mentors: community leaders, Alumni Chapter members and Alumni network members will be accessible for mental health resource and curriculum expansion; this also enables alumni connections to hold pre-planned NIF workshops in varying locations across Canada (south included; potential program expansion). Partners: NIF will gain a greater range of valuable connections, especially those which share our aims (eg. regional governments and companies that support wellness programs); this will aid in the expansion and development of NIF-facilitated programs. Cross-promotion: by promoting each other’s developments on websites and social/news media, we can reach and engage a larger audience; moreover, NIF can engage potential SOI applicants during workshops and mentor them throughout SOI enrollment processes. Cross-consultation for development: NIF can seek support and guidance from SOI team members while providing a perspective on alumni engagement; and NIF can help develop a mental wellness curriculum during and post SOI expeditions and provide a continual mental wellness presence at SOI. - Blog post written by the one and only Blog Ambassador, Derek Leung. Nature has an amazing effect on us. Blue sky with cumulus clouds wisping away; brushstrokes of green foliage covering the foreground and background. Fresh air flows through our lungs, while we feel the warmth of the sun above us, peeking through the forest canopy. When we open our ears, the crunch of deadfall under our feet sets the rhythm for the melody around us: the successive dropping glissandos of Cardinalis cardinalis accompanied by the tambourines of Populus tremuloides—sensory overload, if you are paying attention. Here are three ways that describe how exploring nature can improve your mental wellness. Massasauga Rattlesnake (Sistrurus caternatus) on the Georgian Trail, Georgian Bay Islands National Park. Photo courtesy of Teddie Leung. Stimulating your senses helps to increase your awareness of surroundings, while decreasing the frequency of internal thoughts. That is, it keeps you mindful of your external and internal experiences and keeps you thinking in the present. This is the crux of mindfulness meditation, and it aids in stress reduction and increased attention. Awareness of the senses is also key to developing strong visualisation skills, which can train your brain via neuroplasticity. When I close my eyes, I find myself in a solitude of sound during the middle of August, facing the clear blue Eva Lake with a backdrop of mountain, Picea engelmannii and warming sun. The return trail winds 7.1 km back the way I came, and I’m backed by the Coursier Creek valley. I sit down for lunch, with a ham sandwich in one hand and a container of water in the other. When I open my eyes, Eva Lake reminds me that everything will be okay. Eva Lake, Mount Revelstoke National Park. Panorama taken by Derek Leung. Bright days filled with green leaves and yellow sunlight help set a relaxed, positive mood. Human eyes are preferentially more sensitive towards yellow-green wavelengths, which reflects our natural connection to vegetation. Research has shown that green environments promote positive feelings, as opposed to red environments, which promote anger. Seeing the blue sky indicates to our brain that it is daytime, which controls melatonin levels (i.e. regulates our sleep cycle), and results in increased energy and awakeness. Considering that we sleep for a third of our lives, sleep is an easily-neglected factor of mental wellness. Waking up to a blue sky is crucial to our health! Climbing below the Overhanging Wall, Bruce Peninsula National Park. Photo courtesy of Teddie Leung. Exercise, from hiking, to cycling, to canoeing/kayaking, reminds you that you are on track with your healthy, active life. This is key to improving not only physical fitness, but also mental wellness through a positive body image and self-esteem. Remember: you have to start somewhere; why not now? From biking in Point Pelee National Park, to touring the transition zone at Beausoleil Island (Georgian Bay Islands National Park), to hiking in the backcountry of Mount Revelstoke National Park, I’ve found many places of inspiration in our National Parks. When you try new ways to explore a National Park, you will always discover something new. To read more about the research behind nature and health benefits, check out Mood Walk’s article on the Nurture of Nature. Mood Walks is a program in Ontario which integrates hiking and nature to promote both physical and mental health via nature therapy. North in Focus recently led a workshop and gave a presentation at the Mood Walks Summit 2017 in Toronto! Canada’s National Parks are places for you to explore and find yourself in the process; places for you to think of when you craft your dreams at night; places for you to remember how simple life is, although things can seem complicated. Sunset from Cabin 1 (Sable) at Beausoleil Island, Georgian Bay Islands National Park. Photo courtesy of Teddie Leung. So go out there; do your thing. To read more about Derek’s trips to the National Parks of Canada, please check out his blog on the Parks of North America! North in Focus is excited to announce our new Board of Advisors (BoA) for 2017-2018! With years of experience in their diverse areas of expertise, Advisors will provide valuable guidance to NIF as an organisation and promote NIF’s future workshops. The BoA consists of 6 Advisors: Melynda Ehaloak (Northern Advisor), Ocean Wyatt (Youth Engagement Advisor), Amelia Curran (Mental Health Advocacy Advisor), Ashlee Cunsolo (Wellness Advisor), Eric Foss (Media Advisor), and James Cummings (Finance Advisor). We passionately welcome our newest members to the NIF team! You can find out more about our BoA and their profiles at our website. We look forward to another amazing year at NIF! At times in this busy world, it can be difficult to hear your own voice, let alone stand out amongst other voices. Sometimes it is easy to get caught up in life; sometimes it is hard to remember who you are. As encapsulated in a speech during Nain in Focus, by Moo, an enthusiastic participant of Nain in Focus who remains a close friend of NIF, sometimes you just need to sing to be heard. I believe you guys are awesome today. In my journey I’ve learnt that life isn’t always easy, life is a struggle at many times but there’s always a chance to let it be easy and remember, believe in yourself and have courage and learn more and try to keep yourself busy. Life shouldn’t be so bad. Smile and lift yourself up and don’t be afraid. To those who are having a hard time in life, you just need to go for a walk and then take a deep breath. We need to hear your voice above all the other voices and above all the distractions in this world. Your words bring life and your voice speaks promises, your words bring love and light. Let’s share our love in this world. There is no way for yourself to bring yourself down. If you feel like breaking down and crying, it’s okay to cry; you need to release that. I’ve written this because I’ve seen my friends feel the same way. I have hope and a golden heart. Open up your heart and let the sun shine in, tungasugitsi ammalu tungasutsiagitsi, meaning be open and welcoming. I am proud of where I am today and you should be proud too. Everyone here has a lot of heart; don’t be afraid to shine. Thank you for listening so closely; it means so much to me… okay… sing. Check out this awesome article about our very own Ashley Cummings! In the past few weeks, NIF has had the opportunity to participate in two conferences: the Canadian Conference on Promoting Healthy Relationships for Youth (Feb 16-17, 2017 in London) and the Mood Walks Summit 2017 (Feb 25-26, 2017 in Toronto). The first conference, the Canadian Conference on Promoting Healthy Relationships for Youth, hosted a series of talks in the area of relationship violence and mental health challenges. For more information, please visit their conference site here. The Canadian Conference on Promoting Healthy Relationships for Youth was an eye opening opportunity to look at the many facets that encompass mental health. The information that resonated with me the most was learning how your mental health as youth can influence your mental health growing up as an adult not only mentally, but physiologically. This reinforces why it’s so important to connect youth with the knowledge of mental health and create an open space to talk about it so they may understand how to develop positive mental health for themselves and each other. To experience an open and safe space to share our perspectives, experiences and hear about people’s incredible research on mental health is so fundamental and inspiring for North in Focus in order to share that knowledge and help others create an open space to learn more about mental health. The second conference, Mood Walks Summit 2017, focused on the connections between mental health, nature and physical activity. Mood Walks is a provincial program which utilizes outdoor hiking programs to address mental health and well-being. There is a lot of research supporting this idea! If you would like to learn more about the research behind Mood Walks, check out their article on the Nurture of Nature! And for more information about the summit itself, visit the Mood Walks Summit page. I was fortunate enough to be able to represent North in Focus at two conferences in the past month. They were excellent opportunities to learn a lot, and make connections with mental health professionals. Thank you to ambassadors Bailey and Becca for joining me! At the Canadian Conference on Promoting Healthy Relationships for Youth in London, Dr. Vaillancourt began her keynote by reminding the audience that depression is the leading cause of disability in Canada. Clearly this is an issue that needs to be addressed in order to unlock the potential that lies within so many, unfortunately “we turn a blind eye when we don’t see a black eye”. Later in the conference, Dr. Rodger emphasized the importance of increasing mental health literacy in all community members, since there will never be sufficient formal resources. In her workshop about Inuit mental health, Dr. Morris spoke to the intense resilience and creativity that exists in Inuit populations due to the harsh environmental conditions in the North. She then outlined multiple Inuit-identified solutions to the current epidemic of mental illness, including the following: develop positive self-identity, promote healthy relationships, develop lay counselling and intervention skills, and involve all generations. At the Mood Walks Summit in Toronto, NIF led a workshop during the pre-conference which consisted of a few of our staple workshop activities. And since the theme of the event was how getting outside benefits one’s mental wellness, the next day we presented about the importance of going off on the land in Inuit culture. Thanks to Ashley for helping us develop that presentation! Overall, the event was a blast. We had the opportunity to try our hands at graphic design, discuss the Nature Playbook, go for a skate, and participate in a Mood Walk along the waterfront. The Summit was an excellent reminder to prioritize spending time playing outdoors, and we’ll be sure to incorporate this lesson into future NIF programming. Check out our latest news piece with the Western Gazette! In most peoples’ minds there are the concepts of past, present, and future. There is a logical progression of events that occur one after another as the hands of a clock steadily ticks away in the background. In Nain, time didn’t seem to exist. Each class workshop passed with the blink of an eye but the flickering of bonfire flames gleamed forever. The logical tick of the globally calibrated clock no longer existed whilst our circadian rhythms ground to a standstill. Nain in Focus became a haven for which our connections and desires to build a stronger mental health community could flourish without the influence of the outside world. I became immersed in a world where all that mattered was the here and the now. Focus was on the youth and the community around me, learning about their values, their visions, and their needs. We as North in Focus became the facilitators for a mental health workshop that aimed to incorporate as many voices as possible, to mobilize youth for change that would last for the here, the now, but also the future. We laughed, we played, and we talked. We found power in our ability to connect with like minded youth with whom we were the same age. We reciprocated trust and experiences enabling us to truly touch the young hearts of Nain, so much so that discussion of stigma and health dove deeper than we could have ever imagined. The emotions and discussions and activities dissolved as the week progressed, creating an amalgamation of past, present, future into individual memories. Memories so strong that they remain vivid in my mind to this day. Memories of the mental health activities. Memories of the dances and games. Memories of the ideas and dreams for the future. 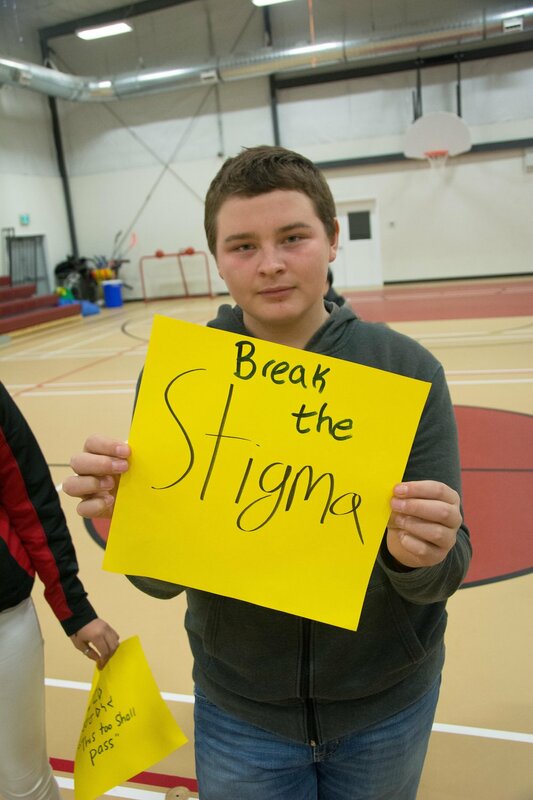 In some words, it became the perfect environment to strike the hearts of youth to create common goals in order to spread Northern pride and end MH stigma. In some other words, it was litt. If felt as though we had all the time in the world. But just like that, it was all over. With our closing ceremony come and gone we had no choice but to bid adieu to the youth in Nain and part our separate ways. Constantly we were and still are told, “Our time was too short, you need to stay longer!” Though on a calendar we spent 8 days in Nain, most felt as though only an hour has passed. We forged connections and support systems that we feel could last a lifetime. As youth, we became stronger. As friends, we became closer. As an organization, we grew brighter. We were not without flaws but now we know how to become stronger. We aren't sure where our next destination lies nor what form North in Focus will take in the future, but we do know everyone would be overwhelmingly grateful to have another experience like Nain. C'était une soirée magnifique au Musée McCord à Montréal. The organization Stories for Humanity had just completed their second magazine, #SantéQCHealth, and that night was set aside as the launch ceremony. The group is an international participatory media outlet leading public discussions about major social issues, with the present looking into "les enjeux du système de santé au Québec," or the issues in the Quebec healthcare system as some would say in English. Amongst the 200 people present at the event was Co-Founder Eva Wu and new NIF Ambassador Raphael Dury. Between listening to panel discussions and learning about the challenges people face when it comes to healthcare, the pair also shared the stories of North in Focus's role in patient care and resource implementation from a youth and community based perspective. Above all else, the team highlighted the messages of community consultation and Indigenous engagement. As the evening progressed the focus shifted to NIF. Following the 2016 Kangiqsujuaq Northern Lights project in northern Quebec, the team knows how often mental health alongside northern community values are overlooked in a southern context, and Stories brought about a platform to discuss these issues. Eva took the stage to speak about the importance of spreading these messages to youth to bring light, positivity, and hope to tackle these problems. Heartstrings were even pulled in the audience as the Northern Lights documentary was screened. Questions poured in following the exhibition of the other world that is northern Quebec, opening up discussions about the injustices that are so greatly impacting the lives of northern inhabitants. Stories for Humanity has provided a collaborative platform for these conversations to form, and the team sees so much potential for development that could drastically change how mental health care is implemented. Nakurmiik, merci à Stories, et à toute à l'heure! Click here to visit the Stories for Humanity Facebook page and website to learn more or participate. Check out the piece on the Northern Lights Documentary in the #SantéQCHealth magazine. Recently, we began an ambassador program to help us reach more people and gain more perspectives. Here are the brief introductions to our wonderful ambassadors! Fatima, a Canadian citizen of Pakistani origin and birth, has studied towards a BA in Peace and Conflict Studies. During her career, she has been fortunate enough to work in places like the Canadian Arctic, Vanuatu and Botswana and has completed academic exchange in Sweden. Her community involvement has varied from volunteering and organizing at the grassroots level to serving as steering committee members for regional and national committees. For her self-directed graduate program, Fatima is interested in looking at Islamic spiritual healing for those experiencing PTSD symptoms. Becca is from Orillia, Ontario and she is currently studying Environmental Science and Psychology at Western University. She chose to get involved with North in Focus because she is very passionate about mental wellness and how our outside environment can affect our mental health! Carrie is a student at Western University currently pursing a degree in Health Science. Originally from Kirkland Lake, a small community in Northern Ontario, Carrie has a passion for the North, as well as the topics of mental health and wellness. She hopes to apply these passions to her role as an NIF Ambassador and would like to increase awareness and education on mental health amongst youth and communities in the North. Raphael is a 21 year-old world traveller, actor, photographer and student. He was born and raised in Montreal, Québec. He is currently studying psychology at university. The organization North in Focus combines two things he is very passionate about: Photography and Mental Health. Caitlin is a 16 year old from Ottawa Ontario. 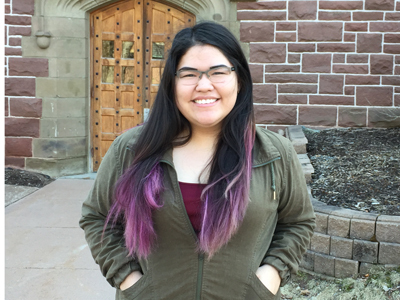 She's been involved in mental health awareness for a couple years and decided to get involved with North in Focus after her trips to the Arctic with the SEVEC exchange program and Students on Ice. Cassie is a student at McGill University. Art has always been a way of forming identity and self-determination, coming together, healing and challenging ideas for her, and she shares that vision with North in Focus. Art has a place in bringing awareness to mental health issues and preventing suicide in Northern communities, and with the increasing rates of suicide there is a need for this issue to be recognized as needing the attention and collaboration of the wider Canadian community. Cassie hopes to bring her experience working in community art and activism, zine-making, filming and photography with youth around social issues. Betty Star is 21 years old. She is originally from Rwanda in Africa but came to Canada when she was 14 years old. She started taking deep interest in mental health at the age of 14. It struck her that for 14 long years she wasn't aware how interesting mental health was. There is still so much to do for this field of health and she knew she wanted to work in the healthcare system later in her life, she had to know her personal interests. Several years later, Betty Star is a student nurse and still deeply interested in mental health. She felt as though she was not showing her interest and desire to make a difference, and when she became aware of NIF, she felt she had to get involved! Ainge is from Toronto, but attends school in London, ON. He chose to work with NIF due to his passion for working towards creating a world where mental illness is not stigmatized, a world where someone can talk openly about their mental health without fear of coming across as weak. Facing a battle with your own mind every day is anything but weak. He wanted to get involved with NIF because it is an organization for him to get involved in mental health promotion and help people live optimal versions of their lives. Derek is currently studying Earth Sciences at Laurentian University. He spends most of his time throwing some rocks (curling) and keeping others (mineralogy). Through North in Focus, he hopes to understand more about mental toughness, whether it be applied on or off the ice. Joe is from a small town North of Toronto called Keswick. He is currently in his second year at Queen’s University doing a Medial in Film and Global Development Studies. He chose to get involved with North in Focus for a handful of reasons but one of the main aspects which caught his attention was the organization’s ambition and goal to raise awareness for issues effecting Inuit youth and the actual work they were doing to make these goals a reality. Malu is 19 years old. She is from Sisimiut, the next biggest city in Greenland. She loves being outside as much as she loves staying inside and reading books. She heard about North in Focus through Facebook, and she was interested right away. She thinks that mental health is important to talk about and that the Northern communities need to focus and work with mental health. Bailey was inspired to get involved as she learned the values that North in Focus encompasses in connecting with and empowering northern youth through combining art with mental wellness. These values align with her passion to learn and collaborate in developing ideas in building awareness and support of mental health through various positive creative outlets. Bailey is from Burlington, Ontario, but currently pursuing a dual degree in Kinesiology and Mechanical Engineering at Western University. Didiane is from Rwanda, currently living in Ottawa, Ontario. Her interest in North In Focus basically grew from an amazing experience she had last year in the Arctic with Students on Ice and her interest in the field of mental health. She is super excited to work with everyone! Abhayjeet is a fifteen-year old high school student living in Surrey. Apart from being an avid ice hockey player and pianist, he loves volunteering. After giving a TEDx Talk in 2013 and leading several initiatives in his school’s environmental club, Abhay took part in the Students on Ice 2016 Arctic Expedition. He became personally connected with issues concerning the Arctic and is now working on a campaign to bring awareness about climate change and suicide prevention. Because of his personal connection with many Inuit students on his Arctic expedition, he realized it was necessary to raise awareness about mental health issues: a goal that coalesces perfectly with NIF. Nikisha is from Richmond Hill, ON. When she is not desperately trying to understand physics, she can be found campaigning for mental health awareness or watching British stand-up comedy. She is very passionate about raising awareness for Canada's Indigenous population as well mental health awareness and she sees North In Focus as an opportunity to help support both of these! She is so excited for this journey with NIF and what's to come! Matthew is a 2nd year student at the University of Toronto studying Molecular Genetics and Pharmacology. He was born and raised in Toronto (the best city in the world), where he has been constantly exposed and interested in different cultures and communities. Suffering from depression himself, he has decided to take a more active role in aiding others. Knowing about the loss of culture and environment, as well as the suffering of the Northern Aboriginal peoples made him join NIF to more actively spread awareness and help in anyway he can. Cassidy is currently studying Medical Sciences at Western University. She wanted to get involved with North in Focus because she wanted to help to get rid of many of the negative feelings surrounding mental health. She agrees it’s incredibly important to talk about mental health and find different ways to practice self-care! Haleh is from St. John's, Newfoundland and Labrador. She chose to be involved with North In Focus because she is extremely passionate about the importance of mental health resources in the North. Living in Labrador exposed her to many of the issues its citizens are facing, and she is happy to have been given the opportunity to raise awareness for them. Check out the latest news piece with The Western News! An article by our videographer, Eric Foss, has been featured in Makivik magazine! Makivik Magazine in its paper format is delivered free of charge to all beneficiary households in all of the Nunavik communities and to a modest mailing list of private individuals, government officials, and interested media. See below for the piece. Check out our latest radio interview with OK Society! Our last full day in Nain began in a spectacular way. Jonathan took Patrick and I on a hike out of town, early enough in the morning that the golden sun glistened off the snow and shone through the trees. We picked berries, and rebuilt an inukshuk that had toppled at the top of the hill we climbed. It was a grand time, and an excellent opportunity to sit down and practice being present. Moments like these - spent in silence, in nature - are invaluable to allow the many thoughts and emotions that have come up this week to sort themselves out. In the afternoon we visited the Level III class. It was sweet to be in a smaller class, where we could learn everyone’s names, and then pick on them to participate in the photography demonstrations. When going over the photography tips, one student really got into his character as the model, working it like a professional. This final in-school session felt very relaxed and smooth, the fourth time’s the charm I suppose! After school, most enjoyed more sports in the gym, while some lent a hand to frame photos as thank you gifts and make a Nain in Focus sign for the closing event. Post-project surveys were distributed as another snack of Rice Krispy squares was enjoyed, and many of the feedback forms were handed back with kind messages asking us to come back! Next up was Onions & Orchids, one of my favourite reflection activities (originally introduced by James Raffan while on expedition with Students on Ice). Wednesday night’s bonfire was a highlight for many, myself included. For half an hour before our dinner break, we handed out journals and introduced the art of writing for self-care. Ashley provided some of James Raffan’s “entry points” to get everyone started, and I led a free-writing activity. For four minutes, the youth were encouraged to write non-stop as I posed a series of questions including: what makes you happy, describe a time you felt alone, who did you reach out to for help or who could you reach out to in the future, who is a mentor of yours, and what makes you feel proud. Warm fuzzies were handed out before the closing event began later in the evening. The incredible Ocean Wyatt served as the Master of Ceremonies for the event, which welcomed participants, their parents, and any other community member who wanted to attend. We showed a slideshow of photos from the week, the angajukKâk (mayor) of Nain spoke, the Labrador anthem was sung, there was a beautiful throat singing performance, and Simeonie (a workshop participant) spoke from the heart about thinking positively. Lastly, Ashley addressed the audience on behalf of the North in Focus team, thanking the various individuals and organizations for supporting the Nain in Focus workshop. -And last but certainly not least, Kaila deBoer and the Nunatsiavut Government for funding this project, allowing us to bring an ambitious idea to life! The night ended with games, a dance party, and bittersweet tears being shed as we all parted ways. Overall, the week was a great success. A core group of about 20 youth participated in the workshop, with one after-school gym session seeing 40 young faces. Over the course of the six days of Nain in Focus: many games of volleyball and ball hockey were played, countless cups of Tetley were consumed, candles were lit around a campfire, laughs and discussions were had, hundreds of supportive messages were written on post-it notes, and plenty of beautiful photos were taken. Nain will always hold a special place in my heart, and I hope to someday return to “our beautiful land”, Nunatsiavut. “Connection” is a word that ties into the many themes and activities explored today. It began with Craig Wyatt, a Level II youth that is an avid Nain in Focus participant, being very engaging with discussions relating to Ashley’s previous struggles with depression and ensuring that she knew that her struggles do not define her. Inuit games are another activity that displayed the cultural connection that ties into mental health, developing deeper passion for Inuit culture while being active to promote self-care. While this allows for self-care and sport, it also allows youth to find others to connect with while playing the games that are embedded within culture. Finally, one of the most deeply connecting aspects of Nain in Focus is our presentation by Maria Merkuratsuk. She shared her life story, touching on the many topics that we have developed over the course of our program. She shared the difficult times of her life as well as the good times, all the while praising the North for its endless beauty. She spoke about the people and things that gave her hope during hard times, likening difficulty to darkness and the hope as a candle. Everything can be seen with the candle and it gets one through the darkness. Those present during Maria’s presentation gave her their complete attention, listening to her story and advice. The room was enveloped in love and it was deeply felt by each person within it. Connection was deepened between youth and Maria with attentiveness and gratitude exchanged between. To cap off our evening, “warm fuzzies” were exchanged with youth writing personal notes to each other to show the love and connection felt between friends and family. With a sense of community building and connections deepening, love is felt throughout with many individuals admiring one another for their unique traits and interests. The relationships being developed further will continue strengthening with love, gratitude, and positivity and the entire NIF team is in awe for being able to witness such emotion.